^ Waggoner, Ben M. (2000). Smith, David; Collins, Allen (eds.). "Anthozoa: Fossil Record". Anthozoa. UCMP. Retrieved 23 March 2009. ^ Tun, K.; Chou, L.M. ; Cabanban, A.; Tuan, V.S. ; Philreefs; Yeemin, T.; Suharsono; Sour, K.; Lane, D. (2004). "Status of Coral Reefs, Coral Reef Monitoring and Management in Southeast Asia, 2004". In Wilkinson, C. (ed.). Status of Coral Reefs of the world: 2004. Townsville, Queensland, Australia: Australian Institute of Marine Science. pp. 235–76. The Battle of the Coral Sea, fought from 4–8 May 1942, was a major naval battle between the Imperial Japanese Navy (IJN) and naval and air forces from the United States and Australia, taking place in the Pacific Theatre of World War II. The battle is historically significant as the first action in which aircraft carriers engaged each other, as well as the first in which the opposing ships neither sighted nor fired directly upon one another. On 3–4 May, Japanese forces successfully invaded and occupied Tulagi, although several of their supporting warships were sunk or damaged in surprise attacks by aircraft from the U.S. fleet carrier Yorktown. Now aware of the presence of U.S. carriers in the area, the Japanese fleet carriers advanced towards the Coral Sea with the intention of locating and destroying the Allied naval forces. On the evening of 6 May, the direction chosen for air searches by the opposing commanders brought the two carrier forces to within 70 nmi (81 mi; 130 km) of each other, unbeknownst to both sides. Beginning on 7 May, the carrier forces from the two sides engaged in airstrikes over two consecutive days. On the first day, both forces mistakenly believed they were attacking their opponent's fleet carriers, but were actually attacking other units, with the U.S. sinking the Japanese light carrier Shōhō while the Japanese sank a U.S. destroyer and heavily damaged a fleet oiler (which was later scuttled). The next day, the fleet carriers found and engaged each other, with the Japanese fleet carrier Shōkaku heavily damaged, the U.S. fleet carrier Lexington critically damaged (and later scuttled), and Yorktown damaged. With both sides having suffered heavy losses in aircraft and carriers damaged or sunk, the two forces disengaged and retired from the battle area. Because of the loss of carrier air cover, Inoue recalled the Port Moresby invasion fleet, intending to try again later. Although a tactical victory for the Japanese in terms of ships sunk, the battle would prove to be a strategic victory for the Allies for several reasons. The battle marked the first time since the start of the war that a major Japanese advance had been checked by the Allies. More importantly, the Japanese fleet carriers Shōkaku and Zuikaku—the former damaged and the latter with a depleted aircraft complement—were unable to participate in the Battle of Midway the following month, while Yorktown did participate, ensuring a rough parity in aircraft between the two adversaries and contributing significantly to the U.S. victory in that battle. The severe losses in carriers at Midway prevented the Japanese from reattempting to invade Port Moresby from the ocean and helped prompt their ill-fated land offensive over the Kokoda Track. Two months later, the Allies took advantage of Japan's resulting strategic vulnerability in the South Pacific and launched the Guadalcanal Campaign; this, along with the New Guinea Campaign, eventually broke Japanese defenses in the South Pacific and was a significant contributing factor to Japan's ultimate surrender in World War II. It is bounded in the west by the east coast of Queensland, thereby including the Great Barrier Reef, in the east by Vanuatu (formerly the New Hebrides) and by New Caledonia, and in the northeast approximately by the southern extremity of the Solomon Islands. In the northwest, it reaches to the south coast of eastern New Guinea, thereby including the Gulf of Papua. It merges with the Tasman Sea in the south, with the Solomon Sea in the north and with the Pacific Ocean in the east. On the west, it is bounded by the mainland coast of Queensland, and in the northwest, it connects with the Arafura Sea through the Torres Strait.The sea is characterised by its warm and stable climate, with frequent rains and tropical cyclones. It contains numerous islands and reefs, as well as the world's largest reef system, the Great Barrier Reef (GBR), which was declared a World Heritage Site by UNESCO in 1981. All previous oil exploration projects were terminated at the GBR in 1975, and fishing is restricted in many areas. The reefs and islands of the Coral Sea are particularly rich in birds and aquatic life and are a popular tourist destination, both nationally and internationally. The city, officially chartered on July 10, 1963, was master-planned and primarily developed by Coral Ridge Properties, which was acquired by Westinghouse in 1966. The city's name is derived from the company's name, and was selected after several earlier proposals had been considered and rejected. Despite the name, there are no natural springs in the city; Florida's springs are found in the central and northern portions of the state.During the 1970s, 1980s, and 1990s the young city grew rapidly, adding over 35,000 residents each decade. Coral Springs has notably strict building codes, which are designed to maintain the city's distinctive aesthetic appeal. The city government's effective fiscal management has maintained high bond ratings, and the city has won accolades for its overall livability, its low crime rate, and its family-friendly orientation. Coral snakes are a large group of elapid snakes that can be subdivided into two distinct groups, Old World coral snakes and New World coral snakes. There are 16 species of Old World coral snake in three genera (Calliophis, Hemibungarus, and Sinomicrurus), and over 65 recognized species of New World coral snakes in three genera (Leptomicrurus, Micruroides, and Micrurus). Genetic studies have found that the most basal lineages are Asian, indicating that the group originated in the Old World. Corallimorpharia is an order of marine cnidarians closely related to stony or reef building corals (Scleractinia). They are mostly tropical, with a narrow column topped with a wide oral disc. The tentacles are usually short or very short, arranged in rows radiating from the mouth. Many species occur together in large groups. In many respects, they resemble the stony corals, except for the absence of a stony skeleton. Corallimorpharians occur in a wide range of marine habitats, and are associated with phase shifts in coral reef ecosystems that result in a change from a hard-coral dominated reef to a soft-coral dominated one. Many species are also common invertebrates kept in marine aquaria. The Great Barrier Reef is the world's largest coral reef system composed of over 2,900 individual reefs and 900 islands stretching for over 2,300 kilometres (1,400 mi) over an area of approximately 344,400 square kilometres (133,000 sq mi). The reef is located in the Coral Sea, off the coast of Queensland, Australia. The Great Barrier Reef can be seen from outer space and is the world's biggest single structure made by living organisms. This reef structure is composed of and built by billions of tiny organisms, known as coral polyps. It supports a wide diversity of life and was selected as a World Heritage Site in 1981. CNN labelled it one of the seven natural wonders of the world. The Queensland National Trust named it a state icon of Queensland.A large part of the reef is protected by the Great Barrier Reef Marine Park, which helps to limit the impact of human use, such as fishing and tourism. Other environmental pressures on the reef and its ecosystem include runoff, climate change accompanied by mass coral bleaching, dumping of dredging sludge and cyclic population outbreaks of the crown-of-thorns starfish. According to a study published in October 2012 by the Proceedings of the National Academy of Sciences, the reef has lost more than half its coral cover since 1985.The Great Barrier Reef has long been known to and used by the Aboriginal Australian and Torres Strait Islander peoples, and is an important part of local groups' cultures and spirituality. The reef is a very popular destination for tourists, especially in the Whitsunday Islands and Cairns regions. Tourism is an important economic activity for the region, generating over AUD$3 billion per year. In November 2014, Google launched Google Underwater Street View in 3D of the Great Barrier Reef.A March 2016 report stated that coral bleaching was more widespread than previously thought, seriously affecting the northern parts of the reef as a result of warming ocean temperatures. In October 2016, Outside published an obituary for the reef; the article was criticized for being premature and hindering efforts to bolster the resilience of the reef. In March 2017, the journal Nature published a paper showing that huge sections of an 800-kilometre (500 mi) stretch in the northern part of the reef had died in the course of 2016 due to high water temperatures, an event that the authors put down to the effects of global climate change. The percentage of baby corals being born on the Great Barrier Reef dropped drastically in 2018 and scientists are describing it as the early stage of a "huge natural selection event unfolding". The reason behind low birth of new corals is that many of the mature breeding adults died in the bleaching events of 2016-17, and thus could not produce offspring. The types of corals that reproduced changed too, which points towards the fact that there will be long-term reorganisation of the reef ecosystem if the trend continues. A polyp in zoology is one of two forms found in the phylum Cnidaria, the other being the medusa. Polyps are roughly cylindrical in shape and elongated at the axis of the vase-shaped body. In solitary polyps, the aboral end is attached to the substrate by means of a disc-like holdfast called the pedal disc, while in colonies of polyps it is connected to other polyps, either directly or indirectly. The oral end contains the mouth, and is surrounded by a circlet of tentacles. Many reefs result from natural, abiotic processes—deposition of sand, wave erosion planing down rock outcrops, etc.—but the best known reefs are the coral reefs of tropical waters developed through biotic processes dominated by corals and coralline algae. The shape and appearance of each coral colony depends not only on the species, but also on its location, depth, the amount of water movement and other factors. Many shallow-water corals contain symbiont unicellular organisms known as zooxanthellae within their tissues. These give their colour to the coral which thus may vary in hue depending on what species of symbiont it contains. Stony corals are closely related to sea anemones, and like them are armed with stinging cells known as cnidocytes. Corals reproduce both sexually and asexually. 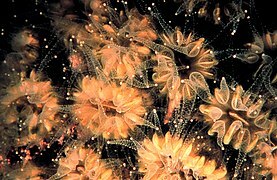 Most species release gametes into the sea where fertilisation takes place, and the planula larvae drift as part of the plankton, but a few species brood their eggs. Asexual reproduction is mostly by fragmentation, when part of a colony becomes detached and reattaches elsewhere. 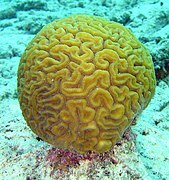 Stony corals occur in all the world's oceans. Much of the framework of modern coral reefs is formed by scleractinians. 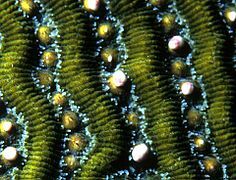 Reef-building or hermatypic corals are mostly colonial; most of these are zooxanthellate and are found in the shallow waters into which sunlight penetrates. Other corals that do not form reefs may be solitary or colonial; some of these occur at abyssal depths where no light reaches. Stony corals first appeared in the Middle Triassic, but their relationship to the tabulate and rugose corals of the Paleozoic is currently unresolved. Stony coral reefs are dying out worldwide due to human activity, including the effects of global warming and ocean acidification, and may become extinct in the next 100-200 years.